In painting, the term staffage, is used to refer to the animal and human figures depicted within the composition. 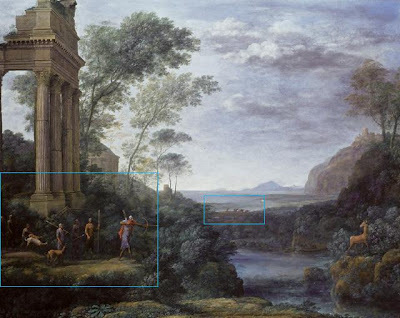 Staffage figures can be usually be found within a landscape scene where their role within the painting is not the main subject of the work. Therefore the term is can be applied to small animals and figures that are not essential to the subject matter, but rather are used to animate the composition. Claude Lorrain - Ascanius Shooting the Stag of Sylvia (1682). Landscape used as part of a history painting. 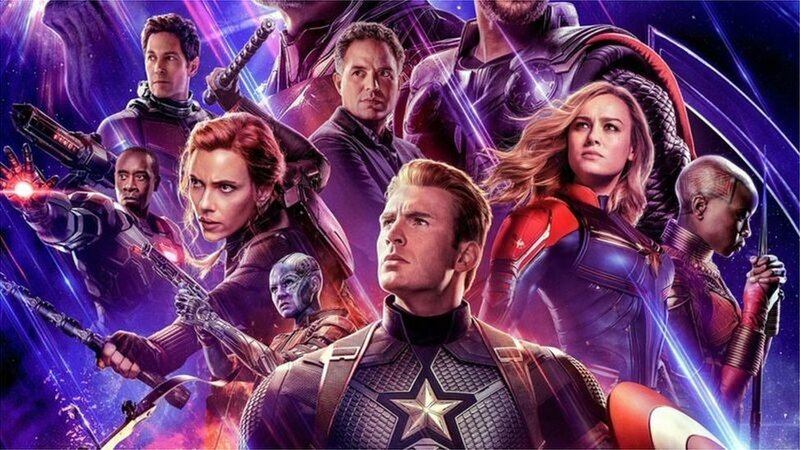 The word carries with it two meanings when referring to a painting, for example: as a general term relating to figures within a scene, even if they are part of the primary subject matter. Another view is that staffage is a descriptive term used to pertain to figures who have little to do with the narrative of the painting and are used for compositional or decorative reasons. The figures therefore serve as accessories, adding an extra dimension to the scene. In addition they give the viewer a sense of scale of the overall composition. The term Enfilade is used to refer to the axial arrangement of a sequence of rooms. In other words a suite of rooms that are formally connect to one another in a linear arrangement through a sequence of doorways. 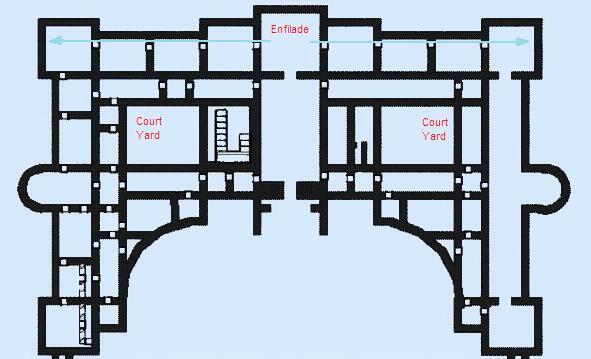 indicate the suite of rooms arranged in Enfilade. 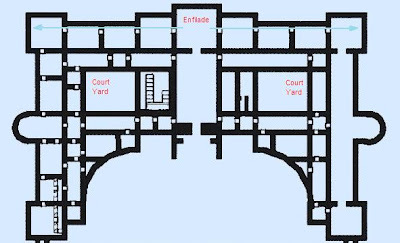 The Enfilade arrangement of principal state rooms (also can be called public rooms) was most common in grand European country houses during the Baroque era. Mainly during the 17th and 18th centuries. The Lantern is the theatrical heart of a church. 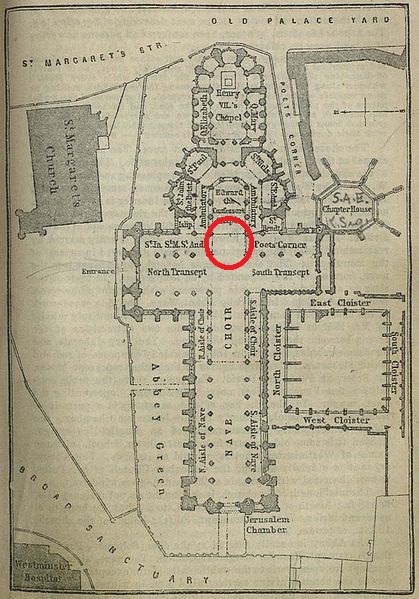 It serves as the focal point for major events, located at the eastern edge of the central crossing, of a traditional cathedral that has been constructed to a cruciform plan. 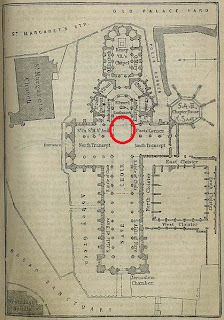 This area of the church is often located under a crossing-tower, which in turn provides streams of light into the centre of the church, hence the term lantern.